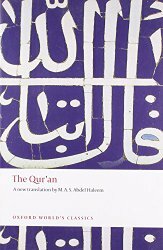 – The Quran has been translated to English numerous times, and there are many great translations (eg; Yusuf Ali, Muhammad Asad, Ali Unal etc). However, this translation from Oxford is a unique one, in the sense that it uses modern language unlike the others which tend to use Shakespearean type of ancient words. With those translations, readers oftentimes have difficulty in grasping the full meaning of the verses. M.A.S. Abdel Haleem (translator) has done a great job – it flows very smoothly and reads very easily. Highy recommended.